I was thrilled to test drive the Gazelle EasyFlow pedal assist electric bike and couldn’t wait to go to Propel Bikes in Greenpoint, Brooklyn to pick it up. 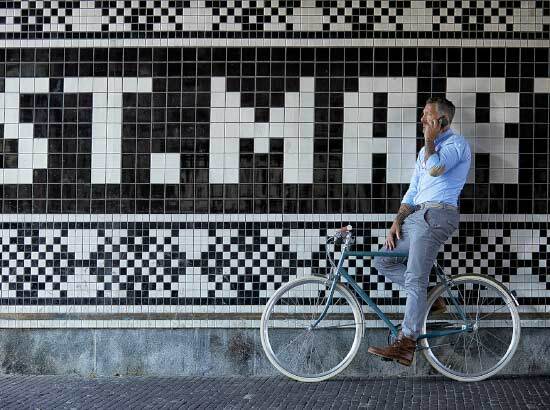 I had fallen in love with the Dutch brand after renting their vintage inspired Gazelle Tour Populair one-speed during my first trip to Amsterdam. I couldn’t wait to try the powerful Shimano STEPS mid-motor and see how it compared to the hub motor my current electric bike has. 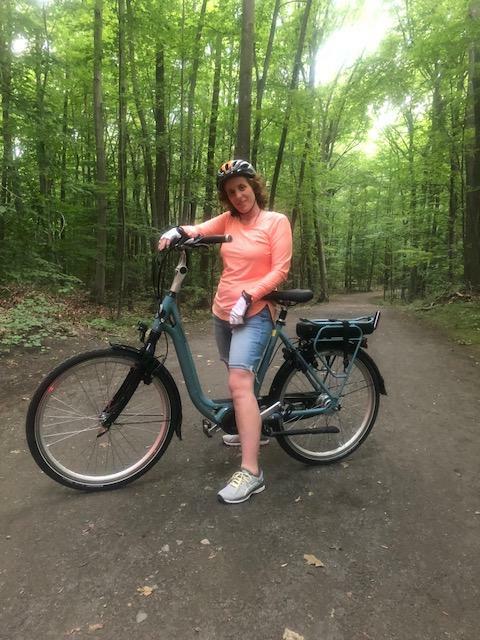 I am a 53-year-old woman and live in the Lower Hudson Valley area just north of New York City, and have been an electric bike rider and owner for the past 4 1/2 years. Ebiking has brought more joy and fun into my life than I could have ever imagined. It gives me a feeling of freedom and aliveness while helping me to stay physically active. Each day I look forward to riding, whether it’s for commuting or recreation. 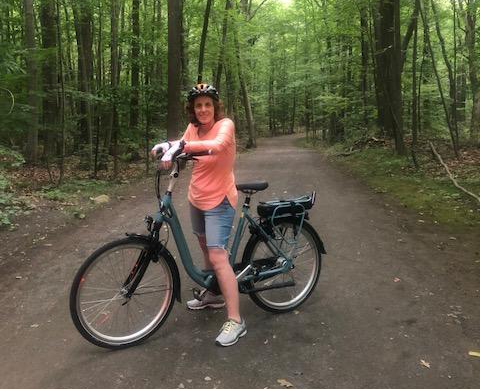 There’s nothing like a leisure ride on the Gazelle EasyFlow, along the Hudson River, through the streets of Manhattan or along the quaint river towns that dot the Hudson valley. Whenever I ride the EasyFlow, I ride longer and farther and I find myself going places I wouldn’t have ventured to before. Each time I step onto the EasyFlow it feels like an adventure. The ease of riding keeps me outdoors longer and has taken me on adventures both on and off road because I’m not deterred by hills and the dread of getting too exhausted, and I now commute to work via electric bike. I feel proud to ride a form of transportation and recreation that doesn’t pollute the environment. I feel much more in touch with my surroundings and just being in the moment. I like the Gazelle EasyFlow pedal assist electric bike because I can bike longer with the assist of the Shimano STEPS mid-mounted motor but still get exercise and feel healthy. I feel more connected and immersed in my surroundings. It’s been life changing for me. The EasyFlow has amazing ergonomics, it is very maneuverable, responsive and with various levels of assist including the ability to ride in manual mode, gives me all the options I need. The Magura hydraulic brakes are crisp, the frame solid but not heavy, the Shimano STEPS motor is strong and got me up every hill I could find with ease. I call this a step thru upright Hybrid; the 8 gears integrate well with the pedal assist giving outstanding mileage. Overall, the Gazelle EasyFlow eletric bike delivers a dynamic yet relaxing ride.